We’d love your help. Let us know what’s wrong with this preview of Begin Again by Leeana Tankersley. What happens when life begins to trip us up and failure starts creeping in? Many of us just keep on doing the same thing, hoping for different results. Some of us look for escape, to find a way out of the mess we feel that we've created. But neither enduring nor escaping is ultimately what we need. The answer is to allow ourselves to begin again, every day, in every part of What happens when life begins to trip us up and failure starts creeping in? Many of us just keep on doing the same thing, hoping for different results. Some of us look for escape, to find a way out of the mess we feel that we've created. But neither enduring nor escaping is ultimately what we need. To ask other readers questions about Begin Again, please sign up. I feel like my soul just got a refresh. This book is more than a book. It’s an invitation to let go and embrace our full identity and rest in Christ alone, which says I don’t have to have it altogether to be loved, to be held, to serve, to be known. If you are one who hustles, has a hard time finding true rest, easily becomes entangled by the mundane tasks of life, read this book. Begin Again is a beautiful invitation to move beyond being stuck in “overwhelmed” and into the callings and giftings God has given us. Leeana’s vulnerability resonated deeply with me, giving her admonitions a ring of authenticity. This book spoke directly to where I am right now, and I finished it feeling refreshed and energized to step forward into the new beginnings God is calling me to. When I saw the cover for this book my first thought was the flowers reminded me of spring and the beautiful colors coming. When I read the excerpt I thought this is a book I would enjoy reading and I did. It was sort of like opening a window into my heart. It reminded me from the first page that wherever you are in your life, you can begin again, whether it's a new day, month, season, year or even hour. The author opens her heart and shares her story of the valleys she's fought and the mountains When I saw the cover for this book my first thought was the flowers reminded me of spring and the beautiful colors coming. When I read the excerpt I thought this is a book I would enjoy reading and I did. It was sort of like opening a window into my heart. It reminded me from the first page that wherever you are in your life, you can begin again, whether it's a new day, month, season, year or even hour. The author opens her heart and shares her story of the valleys she's fought and the mountains she has climbed during her life. She's very open about her struggles. This is a well written book that is easy to navigate through and understand. Leeana Tankersley reminds us that no matter what struggles you are facing today there is another chapter in you story. The pages are full of both inspiration and faith. This is a book that would be great for anyone. Begin Again: The Brave Practice of Releasing Hurt and Receiving Rest is one book that I felt connected. I laughed so hard when Leanna Tankersley told stories about being overwhelmed involving her kids. That definitely spoke to me! She gives such inspiration on how to deal and move on. Begin Again: The Brave Practice of Releasing Hurt and Receiving Rest on to one of my fellow overwhelmed mom friends. I highly recommend it! I am giving it a well deserved 5 stars. I received this book from the publ Begin Again: The Brave Practice of Releasing Hurt and Receiving Rest is one book that I felt connected. I laughed so hard when Leanna Tankersley told stories about being overwhelmed involving her kids. That definitely spoke to me! She gives such inspiration on how to deal and move on. I so loved this book that I am on my second way through it. There is hardly a paragraph I've not highlighted. Leeana's brave and humble honesty shines from every page. This book is an excellent resource for anyone battling codependency. I was looking forward to reading this book because I think we all come to a point where we want, or even need, to begin again in our lives. Unfortunately, this book didn't give me any kind of direction at all. The author shares a lot of her own insecurities and brings us into her life, which I really appreciate in an author. To be let into someone's life, is a privilege and always makes a book more enjoyable. That just wasn't the case for me in this book. I was hoping for some Biblical truth to le I was looking forward to reading this book because I think we all come to a point where we want, or even need, to begin again in our lives. Unfortunately, this book didn't give me any kind of direction at all. I was hoping for some Biblical truth to lead me into learning how to begin again with God's help. There was very little Scripture in this book or leading on how to find a feeling of rest or beginning our lives anew. I'm wondering if this book is for the younger woman or for a baby Christian? I just know it did not resonate with me and when I put the book down after reading it, I couldn't say that I really gained anything from it. I really hate giving a bad review but I must with this book. I felt like it was written in a rambling manner and had no real direction. I didn't come away from this book feeling that I had learned anything or had more insight. I didn't highlight one thing and that's always a clue for me that it's not a book for me. I just gained nothing from this book. I can only give this book 1 star out of 5. I knew this was a book I wanted to read right when I read its subtitle, “The Brave Practice of Releasing Hurt & Receiving Rest.” I have been through several seasons where I’ve been hurt, living hurt, and have desired to release the hurts to receive rest, freedom, and healing. And I think this is a place we have all been or currently are. What I found upon reading this book was a book even richer and deeper than I had imagined. I believe this is the result of having an author who has gone dee I knew this was a book I wanted to read right when I read its subtitle, “The Brave Practice of Releasing Hurt & Receiving Rest.” I have been through several seasons where I’ve been hurt, living hurt, and have desired to release the hurts to receive rest, freedom, and healing. And I think this is a place we have all been or currently are. What I found upon reading this book was a book even richer and deeper than I had imagined. I believe this is the result of having an author who has gone deep within herself and in this book generously shares her space and helps the reader create their own. I found myself right in the middle of Leeana’s message, having learned similar practices and lessons and yet not through the journey and greatly appreciating the wisdom of someone ahead of me. Even with a deeply rooted faith and trust in God, like Leeana, I still seem prone to quitting and growing weary over certain struggles. The way Leeana writes about and unpacks the book’s idea inspired by St. Benedict’s words, “Always we begin again” was incredibly encouraging and invigorating. As I read feelings of perpetual and long-lasting defeat began to slide off me, and hope, with the fresh starts that come with always beginning again, filled me. This book helped me release hurts, especially those deep wounds carried for years, even those from childhood. And if that seems shocking to you, it was to me too – but it has been the sweetest, unexpected gift. The book certainly delivers on its message. Overall Leeana’s writing is beautiful and refreshing. Opening her book and reading her words was like opening the window to a soul that has felt suffocating, enclosed, and confined and letting in some fresh air. She is vulnerable and humble, encouraging and real. Most of all her words are tender and soft making you, the reader, feel safe. Her writing style combined with her personal bravery, vulnerability, and humility will make you feel less alone and expectant. Leeana clearly has done deep soul work in her life and with the Lord and I’m so grateful she’s invited us in. The stories and messages in this book have replaced my wounded spirit with a brave one, and I will forever be grateful to Leeana for bravely writing this book. I can’t recommend this book enough for anyone who has been hurt in life and feels held captive or stuck in their hurt and longs to release their hurts and live a wholehearted life. It’s possible! And it’s a practice! And it’s one we begin again and again! This book will help you learn how to do this. 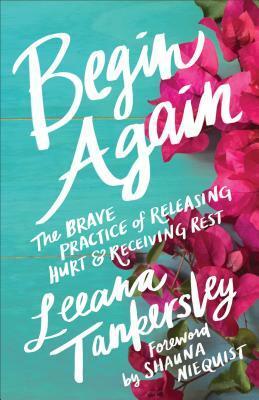 Begin Again: The Brave Practice of Releasing Hurt & Receiving Rest by author Leeana Tankersley is a 182 page Christian Living/Women book which is followed by Acknowledgments, Notes, and Author information. The vividly colored cover with fuchsia colored flowers and large white lettering refuses to go unnoticed. It drew me in. This is the first book I have read by author Tankersley, and I was very impressed. Her style of writing is very much to my liking. 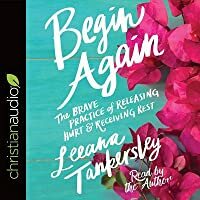 After reading a few pages it felt more Begin Again: The Brave Practice of Releasing Hurt & Receiving Rest by author Leeana Tankersley is a 182 page Christian Living/Women book which is followed by Acknowledgments, Notes, and Author information. The vividly colored cover with fuchsia colored flowers and large white lettering refuses to go unnoticed. It drew me in. This is the first book I have read by author Tankersley, and I was very impressed. Her style of writing is very much to my liking. After reading a few pages it felt more like a chat. I was talking with a friend about our problems and what needed done. She was transparent about her challenges and life, but she didn’t linger over longer on them. The book was well written, easy to understand, well researched and organized. It had Scriptural references and was inspiring as well as encouraging. I felt refreshed after reading it. The author was genuine and to the point in her book. She wanted to be helpful and was. I gleaned things from “Begin Again”. Based on a quote from St. Benedict, “Always we begin again.”, this book was written as encouragement for readers to trust God and begin again when dealing with trials in life. The author leads us to see God is with us every step of the way whether we are struggling with pain, day to day issues, marital problems or whatever the case might be. God is still there as we begin again and helps us with that. We are not alone and never stuck. Always we may begin again. The author provides practical, useful tips and information to assist readers that want to start afresh. Her ideas are to get readers moving beyond the past and the hurt it carries. Relying on God and His plans for our future help us start over. She advises to begin again with God directing your way. None of us can do this on our own. Author Tankersley also says we must realize we have a hurt or pain, whether emotional, mental, or physical. Then we should call out for help. Wow! Easier said than done sometimes, but none of us can do all things alone. So, the author encourages us to begin again by trusting God. Recognizing there is pain and a problem that needs fixed is the starting point. Then she explains we need to realize what we are dealing with can be enormous, as in a move, new job, new relationship, or as small as accepting where we are, without regret. So we need to do the next tiny thing that moves us forward. Readers are nudged to listen for God’s guidance as we change things and handle our life. Aren’t you glad God allows us to write our own stories and edit them every single day? I certainly am very thankful. Actually I am blessed He is there to help and show me what needs to be changed. We receive as many “do overs” as we need. Maybe we need one every morning. That’s okay. God offers them freely and generously. This book made me realize that more. It steered me toward the sunshine of God and today, and away from the gloom of yesterday and its regret and pain. I gladly recommend this lovely, soul stirring book. It stepped on my toes in parts and gave insight on what I could do to change. Do this as a reading group! There are so many that will relate and love the chance to discuss and pray. At times I wondered how the author knew I needed to read just that particular message. Bet she had a little help from above, don’t you. Rating on this is definitely 5 out of 5 stars! I have now read the book, listened (first) and I re-listened to parts of the book as well. In my reading on the kindle, I highlighted aspects and copied quotes into a notebook to review again and again. So I am editing my review. Leanna Tankersley teaches us about ourselves by sharing her own introspection and process over her adult lifetime. She speaks therapeutically when she reminds us that it is our job (especially as women) to dialogue with ourselves as you would a friend, not an enemy. She I have now read the book, listened (first) and I re-listened to parts of the book as well. In my reading on the kindle, I highlighted aspects and copied quotes into a notebook to review again and again. So I am editing my review. Leanna Tankersley teaches us about ourselves by sharing her own introspection and process over her adult lifetime. She speaks therapeutically when she reminds us that it is our job (especially as women) to dialogue with ourselves as you would a friend, not an enemy. She shares that often our response to shame or to self is to treat yourself negatively, critically, but it really is important that we learn and remember how to treat me- and recognize we aren't failing, things are hard because things are hard,... So she shares how she searches for herself, in a move it forward manner, including looking at the source, her deeper belief, knowing she's made for more, to be well, and to follow God's voice. And to recognize that we often put ourselves in a cyclical pattern, instead of stepping forward in the next step of our journey. Her approach to receiving rest- is one I wholeheartedly agree with- she quotes St. Augustine "Our heart is restless until we find rest in Thee." Then St. Benedictine- "Always we begin again." She sees this as the holiness of repetition. The *practice* of beginning again is a gift you give yourself. This book uses terms and language that are counseling or therapy oriented, some religious and benedictine, and widely used, but can have different meanings, and one of the reasons I was drawn to this book. Phrases such as: "always begin again", "the practice", "listening" as a practice, being "centered", "be present", "hold space for myself" terms that I've not been raised with to have the same priority as they seem to have today, but she also uses key theology phrases (I think in the same way I learned them) to share what seems to be a biblical world or self view- like "seal", "rooted", "breathed new life", "love', "God's grace", "mercy",... so this is part of my process- knowing that I am understanding the concepts. The author is sharing how she has learned that in life- it is necessary to 'begin again' often, but it's not as simple as saying 'redo' like we might do with our children on a morning when everything has been off. For adults who are growing, communing with our Great Creator and God, it's a bit more introspective than that. She combines the liturgy, spiritual practices, and then creates her own terms from her life experiences that she uses from that point on. Not only must we 'begin again' but we must be willing to make sure we know we are 'held', 'sit in the truth', "eliminate the dead trees" that our blocking our view- we may need to "burn away" some raw edges, and put our big girl pants on (my term she has a more poetic way of discussing her inner 9 year old self) and face who we are, who we want to be, and how we may need to see ourselves differently with grace as we would a friend, so that we can move ahead, grow, and truly find rest in the Lord and in living this life. She speaks poetically (similar to Ann Voskamp at times, but her own flair for words.) Mixed with words or concepts from "prophets, monks, and mystics" like "choosing the opening up," 'held-ness", "sit in this truth", "feel centered and rooted and you will feel connected to God and to your own soul," words that could be concerning or viewed as new age, but I am learning that we are in an era, where we find language that researchers will use, that people before our time used, that are religious or soul terms, and it seems we are mixing this language into our faith based practices because perhaps this language can articulate clearer, that which is hard to express and is within us. So I admit, that's part of my uncomfortableness in hearing and reading this book. I'm working through the meaning and implications of the concepts being explained or revealed. But I'm recognizing that is a strength as I'm making this my own process and thoughts, and taking what perhaps on my own, I would never have found words to share. My review is between I really liked it and it was amazing- because it's a book that draws you to think deeply (which makes it amazing in my thinking) but at times my own mind is too cluttered to really grasp all of the expressions and applications that the author used in her story telling, and I'm having to re-read and re-think as I internalize, and maybe that's an argument for marking it an 'amazing' book. Perhaps I need my own scale! I'm still processing this book, and need to begin again-- as I listened to the book, and there are so many thoughts that if I were reading, I would re-read, take a note, process, etc. I have paused as I read to internalize, but this book I will listen to several more times I imagine. I was attracted to this book from the post on Ann Voskamp's blog, I was also interested as knowing that Shauna Niequist wrote the forward to it, and the title alone- it would have a language and feel that I've become familiar with through Brene Brown and Shauna Niequist books. The benedictine aspect intrigued me as I know that the liturgies and practices of old so often are still vital and essential. I found this book more intentional, more biblically oriented than I expected. I sort of expected a level of cliche phrases that were pretty generic and undefined, and that is not what I got. I was so pleased to have "begin again" explained, modeled, evaluated and as well connected to truth. There are a few questions in my mind about some of Leanna's techniques to find herself, but that's real thinking and evaluating, so it is helpful. The author and I are close to the same age- and I can envision her life easily and her attempts to embrace rest as well as releasing hurt-- it takes being brave- vulnerable-authentic and real and that's what I appreciate most-- her unguarded sharing of her learning and processing how to be herself and be the best person she truly is- all the time. I'm excited to share with you this new book by Leeana Tankersley, because it holds a host of wonderful wisdom. A few years ago I had the opportunity to attend a conference in Greenville, South Carolina, called Allume. It was at that conference that I had the pleasure of hearing Leeana speak...WOW! I knew then that I wanted to read her book. At that time the book that she had just finished writing was Breathing Room. I thoroughly enjoyed reading Breathing Room--under-lined words and phrases, and I'm excited to share with you this new book by Leeana Tankersley, because it holds a host of wonderful wisdom. A few years ago I had the opportunity to attend a conference in Greenville, South Carolina, called Allume. It was at that conference that I had the pleasure of hearing Leeana speak...WOW! I knew then that I wanted to read her book. At that time the book that she had just finished writing was Breathing Room. I thoroughly enjoyed reading Breathing Room--under-lined words and phrases, and decided I would have to keep this book on my shelf for further reference. Because I do a lot of reading I can not hold on to all my books, however, Breathing Room was such a wonderful read that I had made it a permanent addition to my collection. When I had the opportunity to be part of Leeana's lauch team for her new book Begin Again I immediately signed up to be apart of it. I was thrilled to receive my copy in the mail. Leeana writes to her audience as if we are one of her close friends. She shares openly and honestly with her readers. Begin Again is Leeana's third book. After she finished writing Breathing Room she wrote Brazen. Although I haven't had time to read this one yet, I'm looking forward to reading it. Leeana shares how the Rule of Saint Benedict--always we begin again--has become a lifeline for her. This life that we have been given has plenty of hardships, disappointments, mess-ups, and begin again moments. How comforting would it be if instead of feeling defeated or like a failure we remembered that we can begin again? monk's teach how repetition--beginning again--is in essence a holy expression of life. Our culture is not big on beginning again, but what if this is the very thing that will help to bolster us into new life? What if this is in fact the way to rest--the soul drenching rest that our heart's desire? Leeana's book is divided up into four parts--Too Tight, Brave in the Becoming, Holy Awakening, and On the Other Side of Surrender. We often know that the way we are doing life just isn't working, but still we hold on. Sometimes we have to let go--die--to what we know in order to begin again. We are going to have to let others come alongside us, if we ever hope to begin again the soul work that God has in store for us. We know longer have to strive for the love of God, because we have always had it! When we offer our creating to God--whatever that looks like in our own lives--we remember who we and who he is. We remember that we are to take our place in the creation story. We remember that we were made to pour out. We were made to give ourselves back to him; this is how we find ourselves. --Leeana Tankersley. I found it appropriate that I finished reading Leeanna Tankersley’s newest book, “Begin Again” a few minutes after midnight as the clock hands advanced into Easter. I found it fitting because Leeanna’s book has a consistent undercurrent of resurrection - the resurrection of the spiritual self on an “as needed” basis as part of one’s spiritual journey. I thoroughly enjoyed her previous missive, “Brazen,” and it came across to me as a kind of personal manifesto. Leeanna has entered a completely ne I found it appropriate that I finished reading Leeanna Tankersley’s newest book, “Begin Again” a few minutes after midnight as the clock hands advanced into Easter. I found it fitting because Leeanna’s book has a consistent undercurrent of resurrection - the resurrection of the spiritual self on an “as needed” basis as part of one’s spiritual journey. I thoroughly enjoyed her previous missive, “Brazen,” and it came across to me as a kind of personal manifesto. Leeanna has entered a completely new realm with “Begin Again.” It is about transformation!! She uses the experiences and phases of her life in an incredibly transparent and moving way to offer writing and content of great significance. I believe this is far and away her best writing, her richest content, and her most heart-gripping work. She peels back the layers of her self and her faith journey, but never in a way to come across as though she has all the answers. She does offer unwavering encouragement and a reminder that nothing we do or don’t do will ever change the way God loves us, believes in us, and is there for us. Her writing constantly points to the One who has graced her - and is waiting to grace us as well. Her mantra of “Begin Again” is tied directly to monastic thought, and she weaves the potential for how that might look in contemporary life with eloquence and surety. This book makes your heart breath more in rhythm with its Creator. Leeanna’s filter is predominantly both female and stay-at-home mom, but it would be insulting to insinuate you must be either of those to benefit from what she shares. She passionately provides truths that transcend gender and place. I am a 59 year old male college professor, and found the book both riveting and enlightening. Even before finishing “Begin Again” I was aware of the following: (1) this is a special book, (2) this book challenged me and changed me, (3) I will buy multiple copies to give to people I thought of as I read, (4) I will buy multiple copies to share with the college students I am blessed to teach, (5) I can truthfully say I consider this a must-read. If there was any doubt prior to this book, in my mind and heart, Leeanna joins the pantheon of significant Christian writers to have greatly influenced my personal faith journey: Sarah Bessey, Rachel Held Evans, Nadia Bolz-Weber, Addie Zierman, Diana Butler Bass, Brene Brown, Glennon Doyle Melton, Jen Hatmaker, and Shauna Niequist. If you’re looking for a book that presents real-life pain, suffering, struggles, and failures instead of pithy one-liners and “self-help” language, this is the book for you. I urge you to make a commitment to your heart, your faith, and your life - dive into this book and drink deeply from its well. Your spirit and your soul will find the time well spent, and I believe the partial template she provides to “Begin Again” is essential. The book also has some helpful suggestions from sources other than Leeanna in the Epilogue to consider as you ponder ways to put into practice the message provided. Again, the message is great. Give your life over to Jesus, He will save you, and help you to start over when times are hard and you’re confused with life. I COMPLETELY agree. I’ve been dealing with some hard stuff and big decisions in the last I enjoyed the message of this book, but the execution was extremely lacking. “Always we begin again.” This quote from St. Benedict is the inspiration for Revel author Leanna Tankersley’s newest release, “Begin Again.” Her last book, “Brazen,” became a very big inspiration in my life after it’s release in 2016. Now, only two years later, Leanna has written another book filled with inspiration and encouragement that I am positive will impact the lives of women of all ages. There is something so very refreshing and life-giving about the words “begin again,” and, just as L “Always we begin again.” This quote from St. Benedict is the inspiration for Revel author Leanna Tankersley’s newest release, “Begin Again.” Her last book, “Brazen,” became a very big inspiration in my life after it’s release in 2016. Now, only two years later, Leanna has written another book filled with inspiration and encouragement that I am positive will impact the lives of women of all ages. There is something so very refreshing and life-giving about the words “begin again,” and, just as Leanna says, it offers us a chance to start over, whether it be daily or hourly, or every minute. Do you struggle with forgiveness of yourself? Leanna offers words of wisdom and gentleness that can penetrate through regret and most importantly bring you into the loving arms of Christ. Do you ever feel very “young” and incapable when confronted with the challenges of daily life? Leanna offers us insight of how to move past reprimanding ourselves, and allow ourselves to be taken gently by the hand, and move our way out of feeling incompetent and toward knowing that we are cared for, and then living our lives from that knowledge of safety. Honestly, I could go on for pages of the many beautiful truths you will encounter within the pages of “Begin Again,” but I certainly will not be able to write it as she can, and so I will leave it for you to discover yourself. Speaking of the writing style, this is perhaps what struck me most, even more than the actual concepts of “Begin Again.” The writing of this book will make you feel as if Leanna is not only right there with you, but holding your hand and ministering to you with the care, compassion, and gentleness that will inspire all of us as a reflection of God’s heart toward us. If anything above resonated with you, I encourage to you pick up a copy of “Begin Again.” It is absolutely certain to inspire, encourage, and guide you on a path of what it means to truly move past our failed efforts and start over without all the striving, shame, and mistrust, and move into surrender, joy, and safety. It continually amazes me how a book can so align with the current circumstances in my life. God knows exactly what we need to read so that we stop, we grow, and take in His Word for change to occur. And so it was when I opened the pages of Begin Again: The Brave Practice of Releasing Hurt & Receiving Rest by Leeana Tankersley. “You would be surprised how unaware you are of pain in your body until you take the time to ack It continually amazes me how a book can so align with the current circumstances in my life. God knows exactly what we need to read so that we stop, we grow, and take in His Word for change to occur. Having finally admitted I needed help with migraines, I had just returned with a prescription to relieve the pain I had been living with most days. The desire to begin again, to live without discomfort, had been recognized. Leeana shares a quote by St. Benedict, “Always we begin again.” The moment we admit we need help, we need to let go, we need change – becomes the moment we begin again. Every chapter is filled with experiences shared transparently, openly, extending God’s grace and truth. Leeana causes us to see that God is in every stress, every pain, every failure. He is always at work in our lives making each day a day to begin again. This book is a beautiful call to each of us to cease striving and to surrender to the call of God in our lives, which is as unique and individual as each of us. This book breathed encouragement into my soul as I read each page. This life we have been given is a journey – a winding path – and our God journeys every step with us, alongside of us, and in us. He calls to us to begin again each and every day. ** A copy of this book was provided in exchange for my honest review which was my joy to share. **Disclosure** This book was sent to me free of charge for my honest review from the publisher. All opinions are my own. The answer is to allow ourselves to begin again, every day, in eve **Disclosure** This book was sent to me free of charge for my honest review from the publisher. All opinions are my own. As you grown older, you realize that your life has definitely not turned out like you had planned. If we are being honest with ourselves, I personally believe that a majority of us can say just that. God knows this for us way before we do and thats why we are to rely on Him during this difficult time of discovery and heartache but also a change in our direction or way of thinking. God teaches us to forgive way beyond our wildest expectations. Forgive Him, forgive others, and finally forgive ourselves. It is a struggle sometimes to even keep looking up to Him because we are so depressed over what could of been. This book was sent to me by Revell a division of Baker Publishing Group for me to read and give a review. I’ll be honest, other than the cover being beautiful, the title didn’t appeal to me at first. I didn’t think I would connect with the title and the words inside the book, but boy was I so wrong. I couldn’t put this book down. I love the way Leeana writes and several times while reading, it felt as if she had been inside my head, knew my thoughts and had written this book for me only. It is f This book was sent to me by Revell a division of Baker Publishing Group for me to read and give a review. I’ll be honest, other than the cover being beautiful, the title didn’t appeal to me at first. I didn’t think I would connect with the title and the words inside the book, but boy was I so wrong. I couldn’t put this book down. I love the way Leeana writes and several times while reading, it felt as if she had been inside my head, knew my thoughts and had written this book for me only. It is filled with highlighter marks on almost every page, which you know are signs of a good book. It’s quite possibly my favorite one of this Book Review Roundup; I even told someone that I would be reading this again, which I rarely ever read a book more than once. I don’t want to give any of this book away, but chances are if you are human and breathing, you have been hurt and this book is for you! But it’s more than just about releasing hurt and receiving rest as the title of the book suggests, it’s about practices that will help push you forward. I am simply at a lack for words to adequately describe how this book has ministered so deeply to my soul. This one gets 5 stars…make sure you grab a copy!! Plot: When you are stuck in a place in your life where you feel you have hit rock bottom and there's nothing else around except for some rocks and a hard place, life can seem pretty down. Nothing ever works out for you and the past just keeps hanging around, dragging you down and burdening you with its unbearable weight and pocketfuls of regret and despair. But there's still hope. A very tiny thin stream of hope to light the way. All you need to do is be brave enough to reach out and touch it. Having been through her own hard times, author Leeana Tankersley shows us how to be brave enough to grasp that thread of hope and begin again, drawing ourselves out of our personal pits of despair and leaving behind the past with its pain, regret and darkness. When we begin again, we can finally let go and rest in peace without all the anxiety and inner torment we've been dealing with for so long. And that is well worth it. Likes/Dislikes: Admittedly, I took a shot at reading this because the cover was pretty and it sounded very intriguing. I've been in some tight places and have spent the last year and a half or so reshaping my life and changing it. So this sounded like the perfect book for me. Unfortunately or fortunately, I was already past the point where this book would've been necessary and I found it to be a bit stale and repetitive instead of helpful. But that is just me. All around, a pretty solid book. Rating: PG-15 and up, mainly for reading level. Author Leanna Tankersley leads us on a memoir-like path of healing in this important book. She shares with deep vulnerability about her quest to follow God with her whole heart and what she had to lay down in the process. She talks about trying too hard, numbing herself, surviving instead of thriving. By beginning again every morning during a healing season, she learned to face the truth about herself and lean into God’s truth instead. Her stories are raw and rich. My heart felt heavy as she desc Author Leanna Tankersley leads us on a memoir-like path of healing in this important book. She shares with deep vulnerability about her quest to follow God with her whole heart and what she had to lay down in the process. She talks about trying too hard, numbing herself, surviving instead of thriving. By beginning again every morning during a healing season, she learned to face the truth about herself and lean into God’s truth instead. Her stories are raw and rich. My heart felt heavy as she described a woman’s blistering criticism of her parenting in Target. When she described how she dealt with her needy little girl self, her feelings resonated perfectly with mine. I appreciate her bravery in facing the darkest places inside and coming out stronger in faith. Begin Again doesn’t fit neatly into any one category. It’s not an easy read, but it is a healing and hopeful one. If you’re looking for healing this summer, this book may be just what you need to help you begin again. In Begin Again, Ms. Tankersley shares stories from her walk with God that all believers can relate to. How many of us feel that we have too much baggage to start fresh in our relationship with God? How often do we remind ourselves of all of our past failures and rebellions rather than allowing ourselves to accept God’s forgiveness? How many times have we promised ourselves that THIS is it … this time, we’re going to walk faithfully and always turn to God and life is going to be one positive, fai In Begin Again, Ms. Tankersley shares stories from her walk with God that all believers can relate to. How many of us feel that we have too much baggage to start fresh in our relationship with God? How often do we remind ourselves of all of our past failures and rebellions rather than allowing ourselves to accept God’s forgiveness? How many times have we promised ourselves that THIS is it … this time, we’re going to walk faithfully and always turn to God and life is going to be one positive, faithful walk with the Lord from here on out. All believers have been there. And all believers find themselves inevitably failing again and starting over again. Because we're all just human. Ms. Tankersley meets readers right in the trenches of life – stripping away the Instagram filter that we all seem addicted to, hoping to make it seem like we’ve got it all figured out when really we’re feeling lost and clueless. Beginning again really means beginning again and again and again. Because we’re human and we make mistakes and we wander and stray and get lost and confused. But just when things seem like they’re falling apart, transformation is available with a chance to start fresh…again and again and as many times as we need it. Begin Again is divided into four parts and each part has five or six chapters. It could easily be read as a chapter-a-day devotional or used for discussion in a small group. If you enjoy devotionals and would like to read about ways to forgive yourself, love yourself, and walk forward with God, then give Begin Again a chance. It is available now! I received a free review copy of this book from Baker Publishing Group. All opinions are my own. Recently we have followed Gods' lead into some great unknowns and we are feeling quite 'set up' to (have to?) embrace beginning again, again. So to sit in the silence, to pause and to pray, and then to find the gift of this book, filled with words and wisdom that are gifts as well... it doesn't take a prophetic gifting to see that God is up to something here! Insight... Confirmation... Assurance... All of that, yes! Yes and Amen! To be honest, I have started to read Brazen a few times on my Kindle Recently we have followed Gods' lead into some great unknowns and we are feeling quite 'set up' to (have to?) embrace beginning again, again. So to sit in the silence, to pause and to pray, and then to find the gift of this book, filled with words and wisdom that are gifts as well... it doesn't take a prophetic gifting to see that God is up to something here! To be honest, I have started to read Brazen a few times on my Kindle, but I am pretty sure that is a book I need to HOLD in my HANDS... so I had heard of Leeana but I hadn't really gotten to know her voice or her story. What I loved about this new release is that I didn't feel like I was behind... I didn't feel like I needed a bunch of backstories and yet, even though she is completely honest and transparent, I also didn't feel like I was reading someone's private journals. This is beautiful and skillfully written in a way that invites the Holy Spirit in, and invites us to see how He is working in us, as we read about how He was working in the writer. This is a #MeToo book in all the best ways! I mean, who among us hasn't felt stuck, restless, shut down, or shelved? Who among us hasn't wondered if we were banished to the dark, unable --ungifted, unfit to start over? From her honest personal stories to great quotes and Scriptures, Leeana guides us along a firm foundation as we go from grasping in the dark to moving towards the Light. She welcomes us to embrace dawn... and the every day invitation to Begin Again. Beginning again is something I know well. This book reminded me that to begin I must surrender and in that surrender I will find life, it may look mundane or open up into a brand new adventure. No matter the context, beginning is daily as the sunrises rises I have another chance to start from scratch again. Ah, that cover. Begin Again: The Brave Practice Of Releasing Hurt and Receiving Rest has one of the prettiest covers. So vibrant..beautiful. It's lured me in. So...overall theme of this book. God is love. When you figure that out...when you really truly believe that then you can move mountains..then you can open your hear to the self help, the motivation, the blessings that can free you of the hurts and pains of the past. That's my summary...based on what I took from this book. It's not a large Ah, that cover. Begin Again: The Brave Practice Of Releasing Hurt and Receiving Rest has one of the prettiest covers. So vibrant..beautiful. It's lured me in. So...overall theme of this book. God is love. When you figure that out...when you really truly believe that then you can move mountains..then you can open your hear to the self help, the motivation, the blessings that can free you of the hurts and pains of the past. That's my summary...based on what I took from this book. It's not a large book..so you'd assume there's not much more of that message or any others. Not true..there is more. Great quotes, snippets of good solid advice, mantras you can take with you on your daily missions in life, easy enough thoughts to remember and remind yourself to strive for daily. I have not read author Leeana Tankersley's previous book Begin Again but I am certainly going to now. And then I might revisit this book and all the notes I took from it because it's necessary as a continuous guidance throughout my daily life. It was the cover that drew me in first. As soon as I held this book in my hands, though, I was beyond excited to begin reading. Before long, my highlighters and pencils flew out, and I was underlining, making notes, and checking my own heart. The words are beautiful, poetic, and candid. What makes Begin Again different from the many books on similar subjects that have come before is, 1) the quality of organization. There is no repetition of the same ideas, disorganized flow of thought, or other It was the cover that drew me in first. As soon as I held this book in my hands, though, I was beyond excited to begin reading. Before long, my highlighters and pencils flew out, and I was underlining, making notes, and checking my own heart. The words are beautiful, poetic, and candid. What makes Begin Again different from the many books on similar subjects that have come before is, 1) the quality of organization. There is no repetition of the same ideas, disorganized flow of thought, or other such annoying distracting things. We receive concise, expertly phrased ideas that offer an opportunity to linger over the words. In this, Begin Again deserves careful, slow reading (the best kind, of course). 2) the quality of writing. Tankersley’s words are beautiful, poetic, and candid, literally making this a page-turner. 3) limited personal stories, and more practical ideas. I personally find long narratives in my non-fiction Christian Living books annoying. I was so glad the author used only what was needed to make her point. I found this truly a refreshing, encouraging read. It pointed out many thought patterns and habits I have that I need to get rid of. I can't say what I was thinking when I accepted this book for review, only that it sounded interesting. If you are busy, anything that encourages rest sounds good right? I did listen to this book on audio. And I am no stranger of starting over, beginning again. It seems that I have been doing that in one form or another my entire life. And along with that came the weight that at some point I should have my stuff together. Even when I thought that I did. This book was like sitting down to have I can't say what I was thinking when I accepted this book for review, only that it sounded interesting. If you are busy, anything that encourages rest sounds good right? I did listen to this book on audio. And I am no stranger of starting over, beginning again. It seems that I have been doing that in one form or another my entire life. And along with that came the weight that at some point I should have my stuff together. Even when I thought that I did. This book was like sitting down to have coffee (or in my case hot chocolate) with a friend. I found myself nodding along, and seeing parts of myself reflected back at me. This was a book that read at just the right time. It stripped away all of the stuff and got done to the heart of the matter, the weight that we carry that keeps us from moving forward. And the truth that it's okay and necessary to begin again. To not stay stuck in whatever we are in. Leeana's book is inspired by the line from St. Benedict, "Always we begin again." She explains that it can be both enormous — as in a new job, new relationship, new move to a new city — and as incremental as just accepting where you are, without regret, and doing the next tiny thing that moves you forward. In her friendly, conversational style she shares personal snapshots of her life with three young children and the everyday challenges and emotional hurdles she encounters that threaten to stea Leeana's book is inspired by the line from St. Benedict, "Always we begin again." She explains that it can be both enormous — as in a new job, new relationship, new move to a new city — and as incremental as just accepting where you are, without regret, and doing the next tiny thing that moves you forward. In her friendly, conversational style she shares personal snapshots of her life with three young children and the everyday challenges and emotional hurdles she encounters that threaten to steal her peace, rob her joy and intimidate her into giving up. When life begins to trip and fail us and failure starts to creep in many of us keep on doing whatever we are doing somehow hoping for different results. Or we look for an escape, a way out of the mess we created for ourselves. In Begin Again we are reminded that there are ways we can get through these times have a talk with God every morning about what he wants us to do for the day and write what he puts on our heart down. We are reminded that we need to allow ourselves to Begin Again, everyday in all aspects of our lives. Leanna Tankersley shows women how to forgive themselves and develop patterns of living with lyrical prose. We are reminded too that there is a difference from believing and bullying. I give Begin Again five out of five stars! This book was an easy read which is probably why I spent my evening reading through the book. I found the author to be engaging and welcoming, bringing me further into the chapters. True, I may not have kids that engage every aspect of my life, but I'm equally as tired and overwhelmed at times. To often I do feel restless and stuck within my own life, which is partially why I chose this book to read. While the book is not filled with referencing Bible verses each chapter does begin with either a This book was an easy read which is probably why I spent my evening reading through the book. I found the author to be engaging and welcoming, bringing me further into the chapters. True, I may not have kids that engage every aspect of my life, but I'm equally as tired and overwhelmed at times. To often I do feel restless and stuck within my own life, which is partially why I chose this book to read. While the book is not filled with referencing Bible verses each chapter does begin with either a quote or verse. That said, the book is something I would equate to as being a reminder to let God be first and not our individual needs and expectations. While we aren't being preached to with how to live our lives, we are encouraged to let go sometimes and see where God will lead us. Those moments that give you pause, and then bring a smile to your face. This book met me at the exact time when I needed to begin again but wasn't excited about the prospect. Leeana meets the reader where they are and brings them along on a gentle journey to understanding how beginning again isn't a failure but a grace that is given daily. Her words are kind and soft, never condemning. I could relate to her examples and often found myself underlining nuggets of wisdom. She makes releasing what doesn't serve us, the hurts and ways we talk down to ourselves, attainabl This book met me at the exact time when I needed to begin again but wasn't excited about the prospect. Leeana meets the reader where they are and brings them along on a gentle journey to understanding how beginning again isn't a failure but a grace that is given daily. Her words are kind and soft, never condemning. I could relate to her examples and often found myself underlining nuggets of wisdom. She makes releasing what doesn't serve us, the hurts and ways we talk down to ourselves, attainable and offers rest as a daily practice to love ourselves instead. Leeana Tankersley is the author of Breathing Room and holds English degrees from Liberty University and West Virginia University. She and her husband, Steve, are currently stationed in San Diego, California, with their three children: Luke, Lane, and Elle. Leeana writes about living from the spacious place on her blog, www.leeanatankersley.com.